Since the beginning of the year I have been trying to finish off the rooms in my house. I have been in this house for 5 years and realized that most of the rooms are kinda half decorated. So most of the posts on my blog are me trying to make my house a little more polished! When decorating, I like to use items around the house I already have to make a different look somewhere else. Repurposing something I already have into something new and unique that I will love for many more years to come. So lately I have had my eye on my daughters vanity in her room, I know not good snatching from the kids, lol! But, I bought her a vintage metal vanity a year ago and never got around to painting it until now. So she was happy. I wanted a nice simple table for my entryway. I had a black table there there before and it just seemed to make the room darker than it already was with the paint choice I used (Benjamin Moore Kingsport Grey). So I robbed her of her dainty white vanity. I then cleaned up all the nail polish & make up that had accumulated all over it. (Hey she’s 10). Then I got some 150 sandpaper and got to work shabbin up the edges and making some nice holes in the paint. I really need to invest in a sander as it was tough sanding on a factory painted piece of furniture. So a little elbow grease later here are my results. Shabby Repurposed table. I found these beauties and the local junkie store! Love, love, love, them!! So much lighter now at the front door. Super simple makeover and it didn’t cost me anything! What paint color did you use on your walls? this table looks like it belongs! As always, I love your ideas! i know how you feel about taking forever to decorate a house. So much so, that’s what my link up is kind of about this week. But this turned out so cute!! Love your blog. Your table has been featured for Functional Friday! Beautiful post,Love the table..I have the perfect place for it. .lol.. visiting from How to Nest for Less, thought I’d take a look, very pleased I did. Looks amazing! I so wish I had your decorating skills! 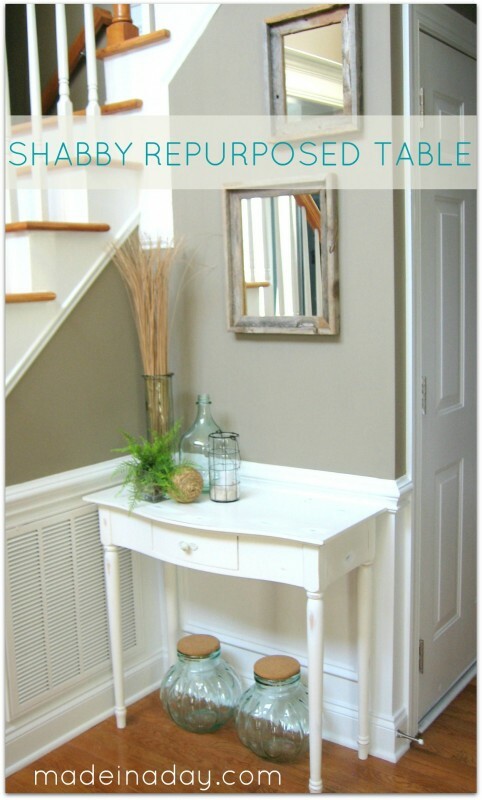 Kim, your entryway is gorgeous and the table looks perfect! You have such a lovely home! Lovely table. You have found just the right spot for it. It’s great to re-cycle things in the house and find them a new spot. That is a perfect spot for a perfect table! Thanks for linking it up! The little entry table is perfect. I’m noticing at my own house that changing up some of the dark pieces has made a world of difference to the feel of things. Really brightens things up. It looks like this one fits nicely in it’s new spot! Your simple styling is fresh and timeless. Beautiful! It looks/feels very calming. Thanks so much for sharing at Fabulous Friday. Nice and bright. 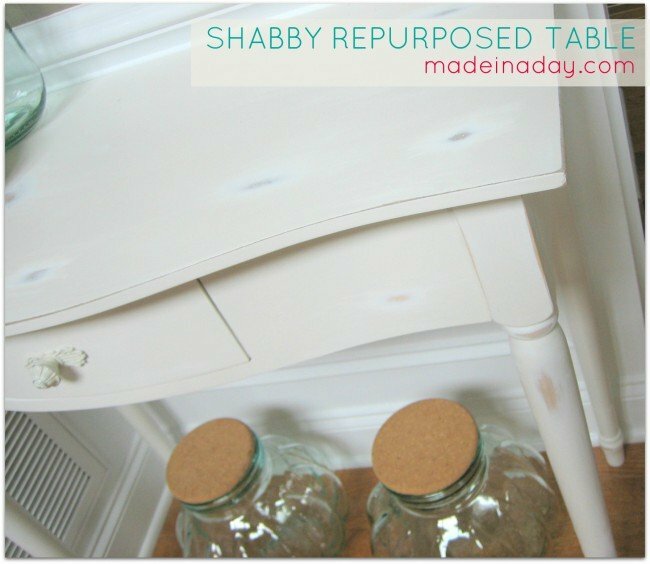 Shabby is my favorite. Love your glass jars. Visiting via Craftionary’s Friday Fun Party. I am now following you. Thanks for sharing. Those are the best kinds of makeovers! I love this sweet little table and it looks so good here. I love how you styled it too! LOVE IT! That table is perfect for your entry, and I especially like how you shabbied it up. Thanks for linking up! This looks so cute – we love the white with the grey walls! Ohhhhh, I love this space! Pinning!! Kim, your table turned out lovely. I enjoy repurposing stuff around the house, it helps to save lots of $$$! What a great idea! I have so much stuff that needs to be re-purposed, I just need the motivation to get it all started. I love your blog, very inspirational for a wanna-be like me! Looks like it’s out of a magazine! Very cute knick knacks too and I love the color on your wall. Perfect, it looks like it was made for that corner! Doesn’t it feel great to put something you already had to a new or better use. I am stopping by through your link on I Should be Mopping the Floor. So pretty and fresh. Love the green bottles. How lovely! I love post like this to inspire me to change things around. Have a great week.